I don't usually have time to make myself a huge elaborate breakfast each morning, but I understand it is the most important meal of the day. I decided to start making myself Greek Yogurt breakfast bowls. They are healthy, filling, and full of protein to keep you feeling full all day. You will also love how delicious these taste. Lately I am the biggest fan of acai bowls. I probably make myself one every morning for breakfast, but lately I don’t have time to blend everything and put it together, and they are hard to eat on the go. I’ve also been trying to add a little protein into my diet, and I found that Greek yogurt is a great source of protein. These Greek Yogurt Honey Breakfast Bowl is my new go to. I can throw it together and eat it on the go. It’s so delicious and is a great source of protein. It is also a breakfast I don’t get sick of, because you can add so much flavor to it, that each breakfast bowl tastes unique. It comes together quickly, and the flavor is amazing. You need to try a Greek Yogurt Breakfast Bowl. what other fruit variations could I make with this recipe? The thing I absolutely love about this recipe, is how easy it is to switch it up. I don’t know about you, but breakfast can be hard for me. I can’t eat the same thing in a row, over and over again. I love to mix up my breakfasts. -Peaches, granola, honey, and cinnamon. -Blueberries, strawberries, blackberries, honey, and granola. -Pineapple, coconut, granola and honey. -Strawberries, strawberry Greek yogurt, granola honey. -Key lime yogurt, bananas, granola and honey. -Mango, pineapple, coconut, granola and honey. You could add any flavor of Greek yogurt you want. I try to stick to the plain, because it has no added sugar. If you are looking for more flavor, you could easily find a fruity one, but check the ingredients for extra sugar. I like the plain, and add honey to it, to create a little sweetness. But if you have the granola and fruit, you don’t need it much sweeter. Looking for a homemade granola recipe? Try our Almond Butter Granola recipe. could i prepare these ahead of time? You could most definitely prepare these breakfast bowls ahead of time. In fact, we recommend it. Greek yogurt doesn’t go bad too fast, so I like to make these a week in advance, in separate jars or containers. Then before I leave, I chop up my fruit, add my granola and I’m good to go. I usually only add my Greek yogurt and honey ahead of time, to avoid having my granola go soft, and my fruit going bad and soggy. 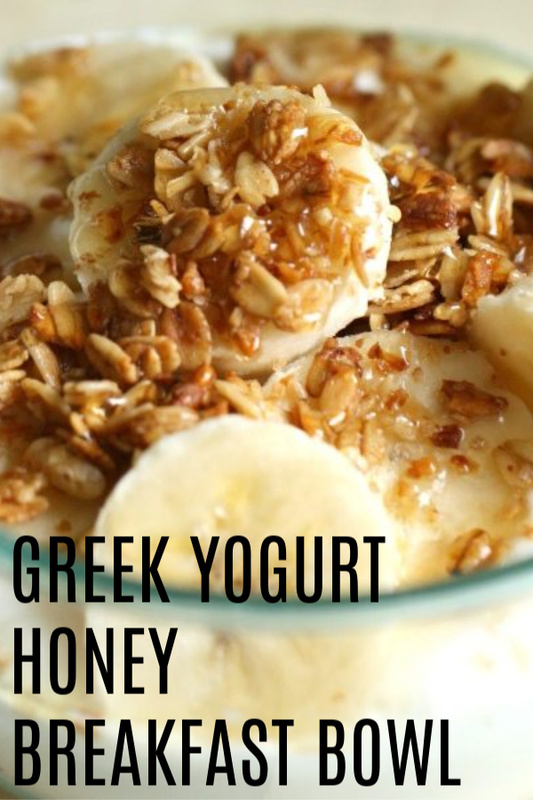 Place the Greek yogurt in the bowl, and drizzle honey, and sprinkle granola and banana slices on top! Eat and enjoy! Oh yes dear Ladies ! This is what I am looking for ! In the morning, before I "land off " to work, I grab the ingredients and finish this great breakfast before coffee time ! Perfect ! Just perfect ! Thank you so much !